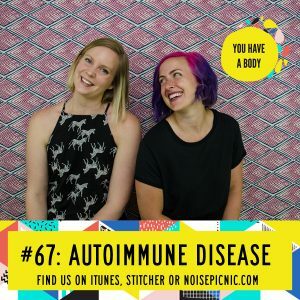 This week on the You Have a Body podcast, Lucia and Hannah dive deep into what autoimmune disorders actually are, how to navigate the rather intense world of managing a new autoimmune diagnosis, how conventional medicine and functional medicine can go hand-in-hand in remission from autoimmune disease, and how to think about exercise and its utility when revamping your schedule to best protect your health. Intrigued yet? Better listen to find out! Like what you’re hearing? Great! Leave us a review iTunes and we’ll send a personal shout out to you!